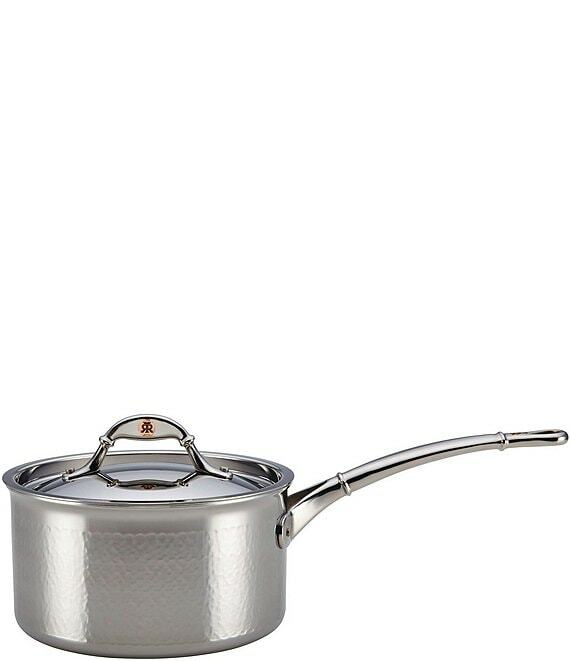 Destined to be treasured across generations, the hand-hammered Ruffoni Symphonia Prima 3.5-Quart Covered Saucepan blends time-honored artistry and contemporary design to provide classic beauty and lasting culinary performance. Ruffoni Symphonia Prima brings the highest-quality Italian craftsmanship to this "molto bellissima" line of stainless steel cookware. Appealing to gastronomes of every level, this hammered stainless steel saucepan is designed with a thick aluminum core between layers of mirror-polished stainless steel, offering both truly exceptional heat conduction and a luxurious kitchen aesthetic. Prepare and deliver the richest, deepest gourmet flavors and textures using the saucepan, from a zesty chili-lime cream sauce to serve over grilled fish, to a delectable orzo al dente side dish tossed with roasted pine nuts, garlic and mozzarella. A gleaming, shapely cast stainless steel handle is dual riveted to the pan and features a stamped copper signet, as does the mirror-finished stainless steel lid. Oven safe to 450°F and suitable for all cooktops, including induction, this alluring Ruffoni stainless steel saucepan is an excellent addition to other heirloom-quality pieces from the Symphonia and Mini collections. Discover the culinary excellence and time-honored Italian design of the heritage-quality Ruffoni Symphonia Prima 3.5-Quart Covered Saucepan.